This is what Sunday afternoons in winter should be about. Quick, easy heart warming desserts that taste like something out of a dream. 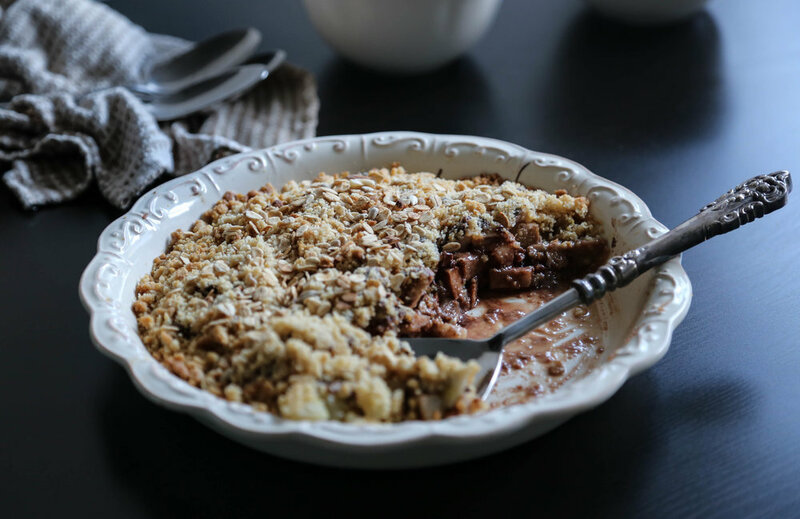 Another winner out of the Nutella cook book, the traditional pear crumble gets the Nutella makeover. There are so many ways you can personalise this awesome recipe, like adding other fruits to the mix like bananas or coconut. I added some toasted muesli to the crumble for a little extra crunch. Suit your sweet self! It's the ultimate winter warmer and crowd pleaser. Perfect for sharing... or not. Wash, peel and cut the pears into small cubes, then layer into an oven proof pie dish. Over a double boiler, heat the Nutella until it's runny. Coat the pears with Nutella, and mix together. Set aside. Cut the butter into small cubes. Place in a mixing bowl with the brown sugar, flour and almond meal. Using your fingers, work the ingredients together until the mixture resembles bread crumbs. Finally, ddd the oats/mueseli. Sprinkle the flour mixture over the pears, and make for approx 30 mins, or until the top is golden brown. Serve with double cream or vanilla custard - and should your heart desire it, a little extra runny Nutella. Yum!